.......here's and interesting cover from Berenku. 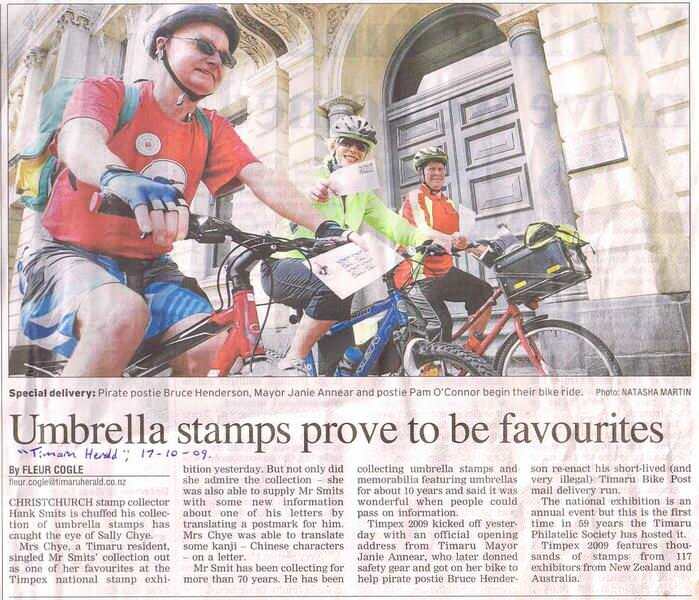 I am happy to print & perforate stamps for anyone. The gauge is perf 12. I prefer small runs, where you want only a few dozen or a few hundred. If you want many thousands, go to De la Rue in London. Timaru 2017 centenary of the visit of the Hospital Ship "Marama" to Timaru. 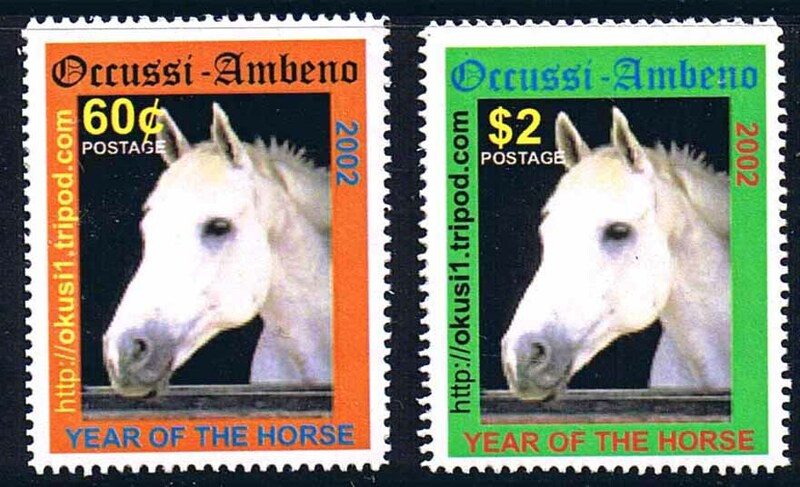 Set of two stamps, laser-printed, and perf 12. 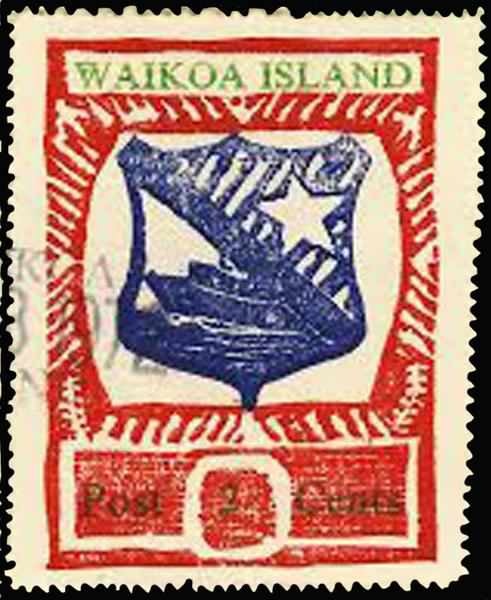 In this example, the stamp dealer who ordered these emailed me some postcards showing the views of the ship, and I then composed them into the two stamps. Quantity done = 300. 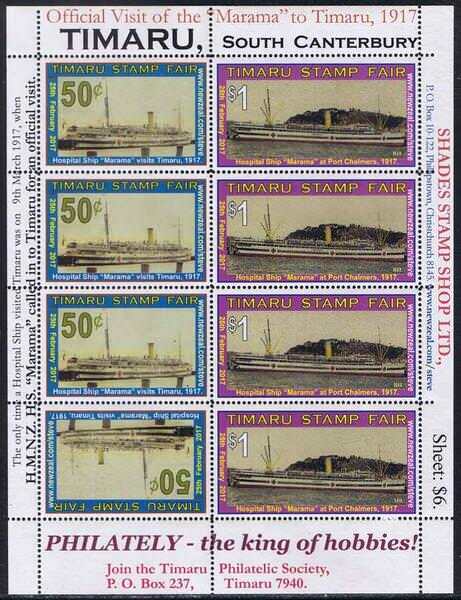 Sold at the Timaru Stamp Fair; a few extras possibly available from Shades Stamp Shop, P.O. 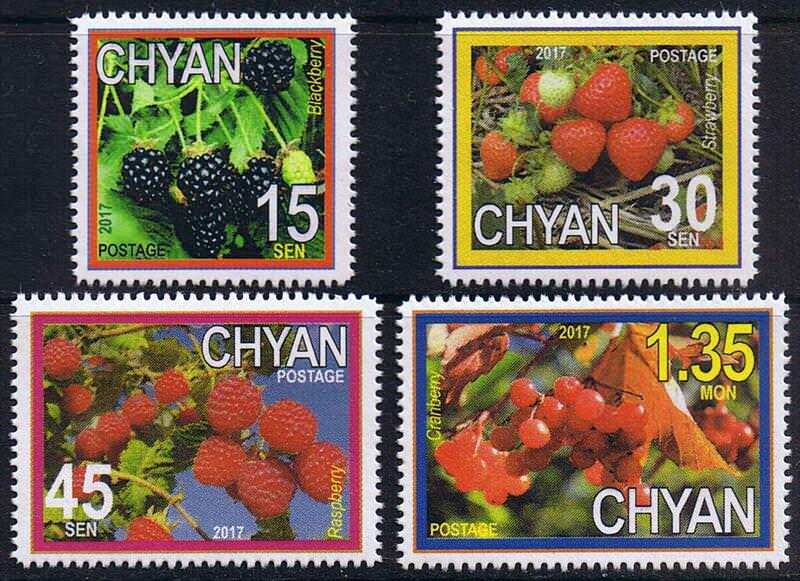 Box 10-122, Christchurch 8145, New Zealand, at $6 per sheet, plus postage. How about I display all my productions (bit by bit, as time permits) on this thread? Some of you may have wondered about how to start a new nation. Let me give an interesting case history: the saga of Bijzland. A year later, to celebrate his birthday, another mutual friend sent me a dozen early photos of Japhyland's founder, going back to his youth days, and asked me to do a Japhyland set using these. So the set was printed, perfed, and secretly brought along to the celebration party, then a big package of minisheets was presented to Japhyland's founder. 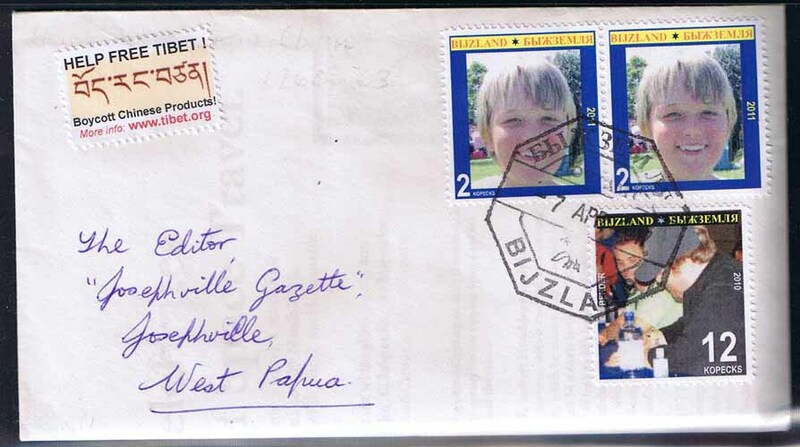 He fished out his datestamp, stuck the stamps on covers and postmarked them, and one was given to each guest. The foregoing is an aside to the main story here. At the birthday, I was chatting with my pal's young son, Brynn, then aged 11. He said that he had contemplated starting a fantasy land himself, called Bijzland. Intrigued, I asked him to write it down (as the spelling is tricky.) I asked him the location, and he told me it is "an island off the coast of Russia." I told him that was quite amazing, for Russian has a character in the alphabet that pronounces "zh" which can only be used in words such as "Bijzland". I told him I'd see what I could do in the way of making him some stamps. So after returning home, I went through my old photos and located a couple of Brynn from the time when his dad and I (with Brynn) attended the Science-fiction convention in Auckland. Brynn was especially enthusiastic to meet one of his heroes, the actor who plays Bender the Robot, from the TV comedy series "Futurama." He queued up to meet Bender and get his autograph, and I took a photo of Bender as he was signing the autograph for Brynn. 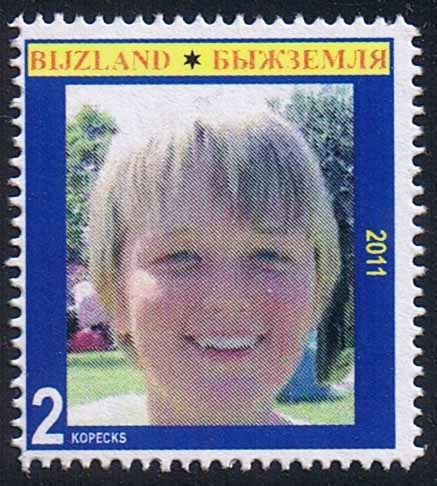 Brynn, aged 11, on the first issue of Bijzland, 2011. 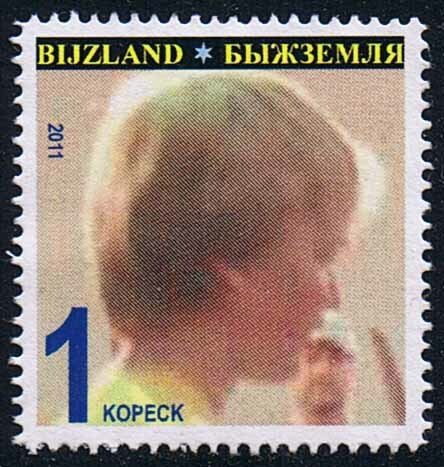 The other two stamps in the first issue showed a rather blurry sideface portrait of Brynn on the 1 kopeck, and "Bender" on the 12k. Brynn again, on the 1k stamp of 2011. "Bender" signs his name, with other celebrities in the background. 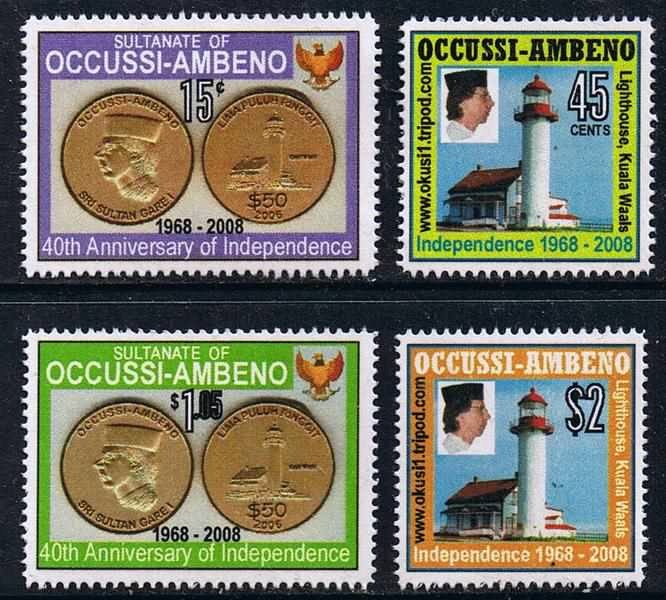 Although the stamp was issued in 2011, it shows "2010" on the stamp, as that was the year the convention where bender signed was held. 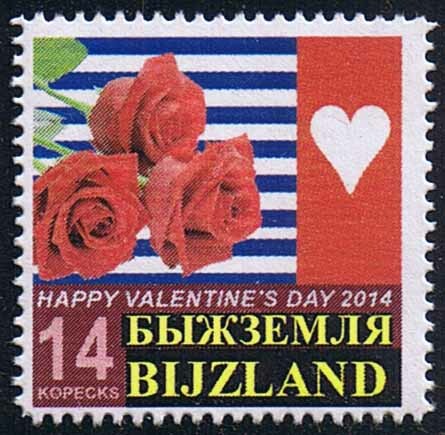 Bijzland 2017 cover to West Papua. Note the bilingual datestamp. Finding a Russian font was tricky, but I got there in the end. I have printed him some other commemoratives over the years since, but as he has grown older, his interests have moved more into "gadgets", “online games”, and "girls", as many teenage boys do. 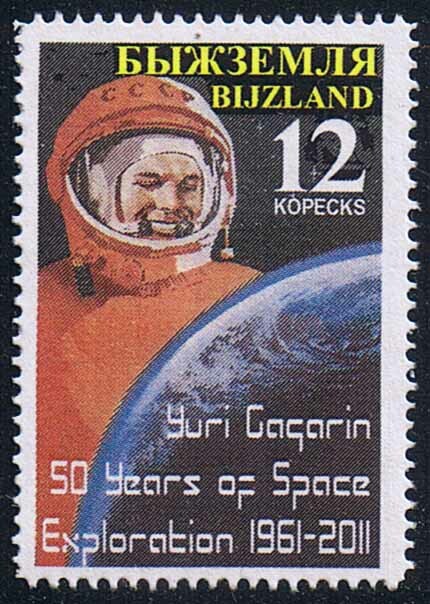 Bijzland 2011 50th anniversary of Yuri Gagarin's first voyage into Space. 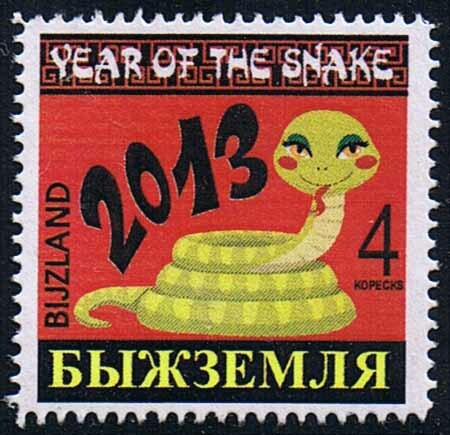 Bijzland 2013 Year of the Snake. 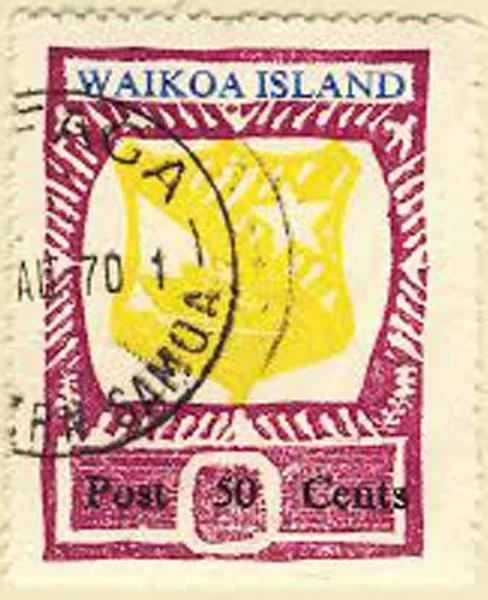 There was a similar Valentine's Day stamp in 2012: that one was a 12k value. The Valentine stamps have been very popular with some of my friends for using on cards each February! 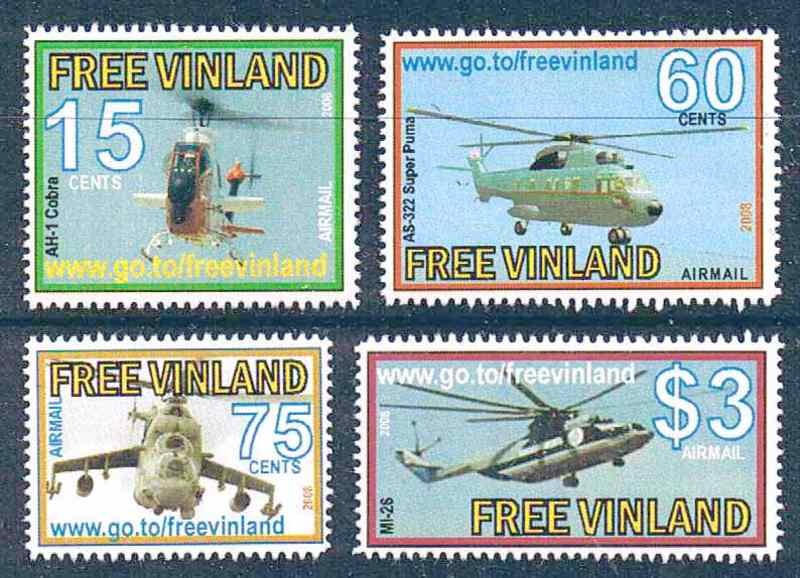 I recommend enclose some stamps (attractive modern commemorative sets and minisheets of your country are best), and request some Bijzland in exchange. 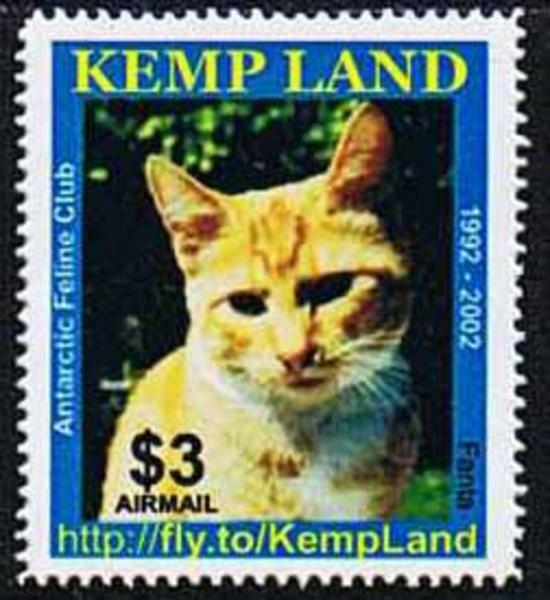 If you feel inclined to make suggestions for new issues while writing, your favorite thematic topic may yet figure on a Bijzland stamp! When printing stamps, I prefer to do them in small compact miniature sheets, so that they can easily fit on a standard album page. 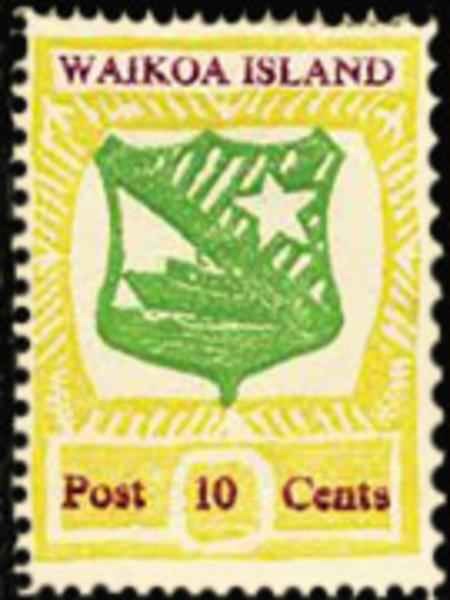 Small sheets are also easy to post: an important consideration in an era where postage is charged by size of envelope. 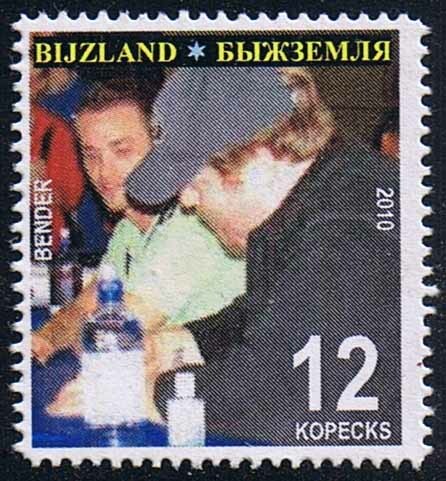 Bijzland 2011 first issue: Brynn and Bender, and my first stamps with Russian inscriptions. Bijzland 2011 50th anniversary of Yuri Gagarin's first space flight. 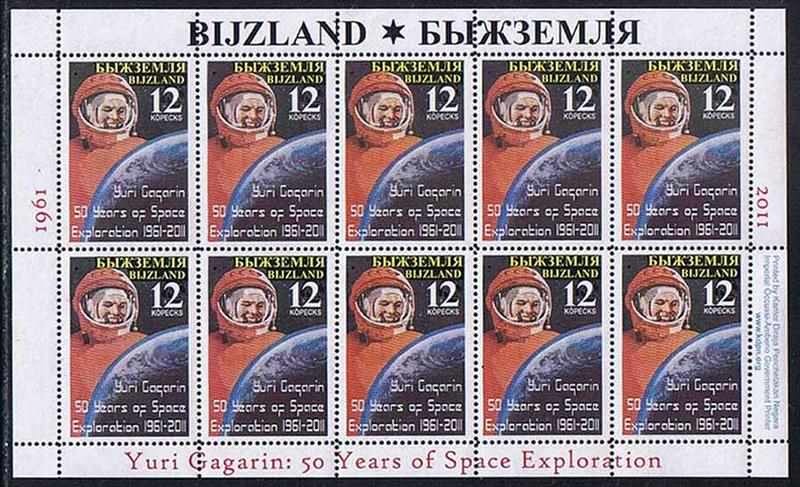 Gagarin became an international celebrity, and was awarded many medals and titles, including Hero of the Soviet Union, the nation's highest honour. Vostok 1 marked his only spaceflight, but he served as backup crew to the Soyuz 1 mission (which ended in a fatal crash). Gagarin later became deputy training director of the Cosmonaut Training Centre outside Moscow, which was later named after him. Gagarin died in 1968 when the MiG-15 training jet he was piloting crashed. The Fédération Aéronautique Internationale awards the Yuri A. Gagarin Gold Medal in his honor. 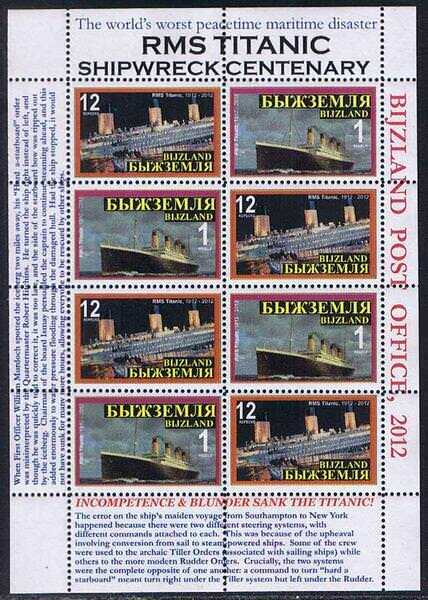 Bijzland 2012 Centenary of the "Titanic" launch and demise. RMS Titanic was a British passenger liner that sank in the North Atlantic Ocean in the early morning of 15 April 1912, after colliding with an iceberg during her maiden voyage from Southampton to New York City. Of the estimated 2,224 passengers and crew aboard, more than 1,500 died, making it one of the deadliest commercial peacetime maritime disasters in modern history. The largest ship afloat at the time it entered service, the RMS Titanic was the second of three Olympic class ocean liners operated by the White Star Line, and was built by the Harland and Wolff shipyard in Belfast. Thomas Andrews, her architect, died in the disaster. Under the command of Edward Smith, who went down with the ship, Titanic carried some of the wealthiest people in the world, as well as hundreds of emigrants from Great Britain and Ireland, Scandinavia and elsewhere throughout Europe seeking a new life in North America. The first-class accommodation was designed to be the pinnacle of comfort and luxury, with an on-board gymnasium, swimming pool, libraries, high-class restaurants and opulent cabins. A high-power radiotelegraph transmitter was available for sending passenger "marconigrams" and for the ship's operational use. Although Titanic had advanced safety features such as watertight compartments and remotely activated watertight doors, there were not enough lifeboats to accommodate all of those aboard, due to outdated maritime safety regulations. Titanic only carried enough lifeboats for 1,178 people—slightly more than half of the number on board, and one third of her total capacity. The Titanic had plenty of time to miss the iceberg but the helmsman panicked and turned the wrong way. Incompetence and blunder were the reasons for the disaster. The error on the ship's maiden voyage from Southampton to New York happened because there were two different steering systems, with different commands attached to each. This was because of the upheaval involving conversion from sail to steam-powered ships. Some of the crew were used to the archaic Tiller Orders (associated with sailing ships) while others to the more modern Rudder Orders. Crucially, the two systems were the complete opposite of one another: a command to turn "Hard a-starboard" meant turn right under the Tiller system, but left under the Rudder. When First Officer William Murdoch spotted the iceberg two miles away, his "Hard a-starboard" order was misinterpreted by the Quartermaster, Robert Hitchins. He turned the ship right instead of left, and though he was quickly told to correct it, it was too late, and the side of the starboard bow was ripped out by the iceberg. The Chairman of the Board of the ship owner White Star Line, J.B. Ismay, who was on the ship, persuaded the captain to continue steaming ahead, and this added enormously to water pressure flooding through the damaged hull. Had the ship stopped, it would not have sunk for many more hours, allowing everyone to be rescued by other ships. Because of Ismay's arrogant stupidity, the sinking of Titanic caused the deaths of 1,514 people in one of the deadliest peacetime maritime disasters in history. Ismay made sure he was among those who got on a lifeboat, leaving 1,514 to perish in the icy sea. He was widely castigated as a coward thereafter, and resigned his chairmanship of the shipping line in 1913. He died in 1937. The day first became associated with romantic love within the circle of Geoffrey Chaucer in the 14th century, when the tradition of courtly love flourished. In 18th-century England, it evolved into an occasion in which lovers expressed their love for each other by presenting flowers, offering confectionery, and sending greeting cards (known as "valentines"). Good fun to see the re-enactment of the post acted out in true fashion. 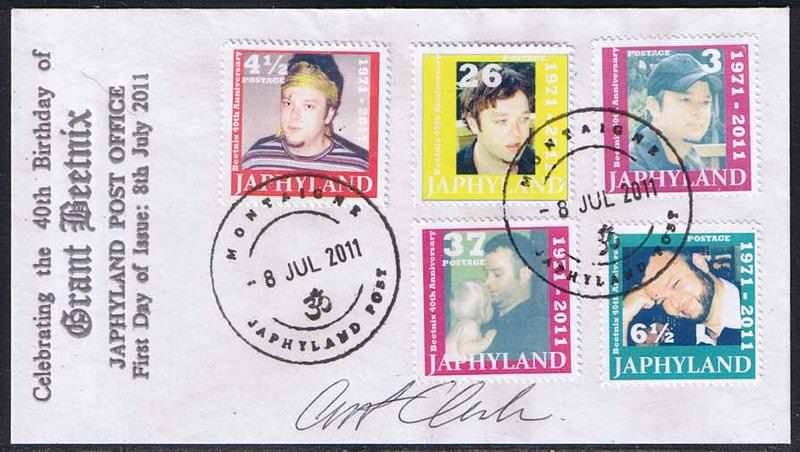 Japhyland 2011 40th birthday of Grant, the Japhyland head honcho, on a signed FDC. The silver text at the left of the cover is thermography, a heat-embossing process, which makes it look like cast metal. 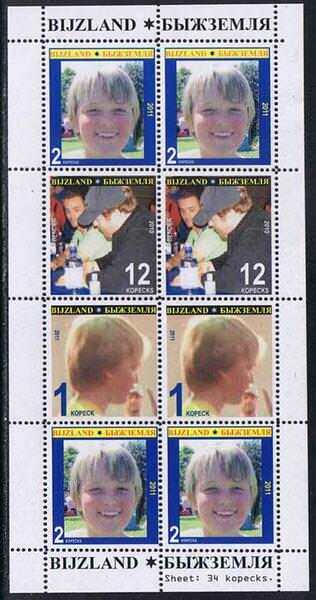 I mentioned Japhyland stamps earlier, and here are some of the set showing Japhyland's founder. His son runs Bijzland, which has been slightly more stampiferous. This set was a "surprise" birthday present for Grant: one of his friends sourced the photos, sent them to me, and I printed the stamps and FDCs in secret, and presented them to Grant at the party. He then affixed stamps to the covers, and fetched his postmark out and cancelled them, then each guest was presented with a signed autographed cover. 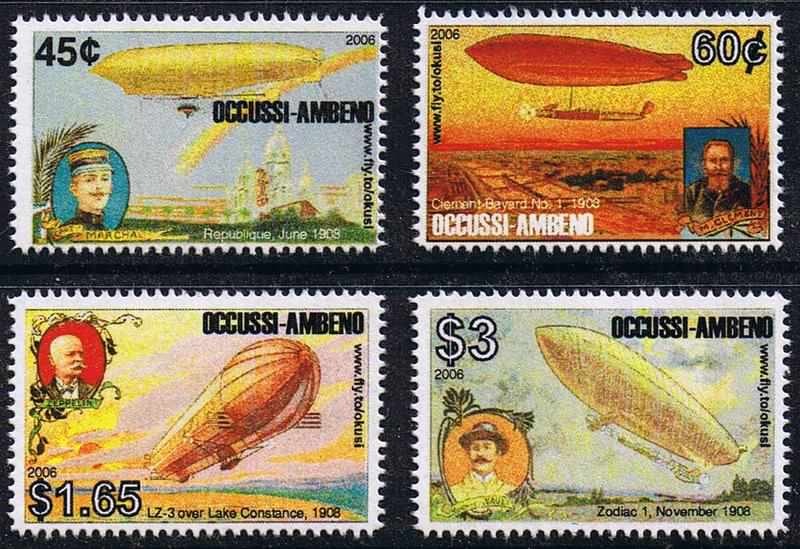 I think there were ten (or maybe 12) stamps in the set, so after tearing up the sheets, each FDC got 5 random stamps affixed, as the small envelopes could not fit the full set. 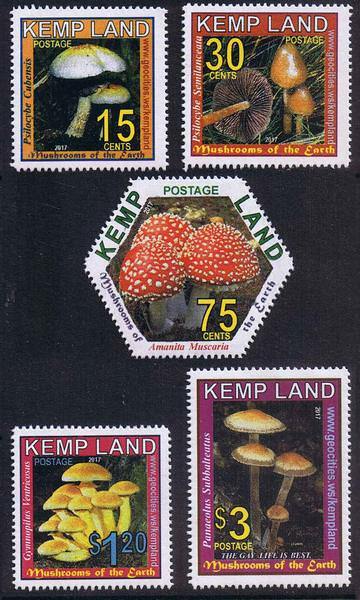 Any collectors seeking these could write to the Bijzland Agency address mentioned earlier, but address it to Japhyland Information Service. I'm sure he would be amenable to trading some. My perforating machine, a huge and heavy foot-powered model made in 1895, and which does perf 12 gauge, still works well (due to almost daily use! 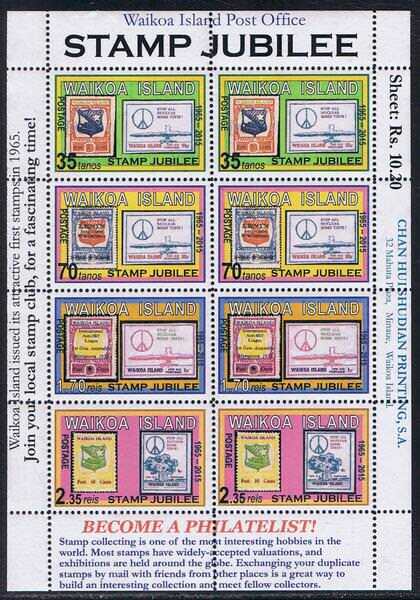 ), and I am happy to perf stamps for anybody, as long as the volume you give me is not too severe. I bought this machine back about 1987 (@ $150 NZ), when a newspaper advert said old printing machinery up for sale. It was mostly metal type fonts (and I bought a few of those too!! ), but getting the vintage perforator was the gem. I have been addicted to it ever since. Prior to then, I used a sewing machine, which does not clean out the holes: it is "stabbing", rather than "punching". 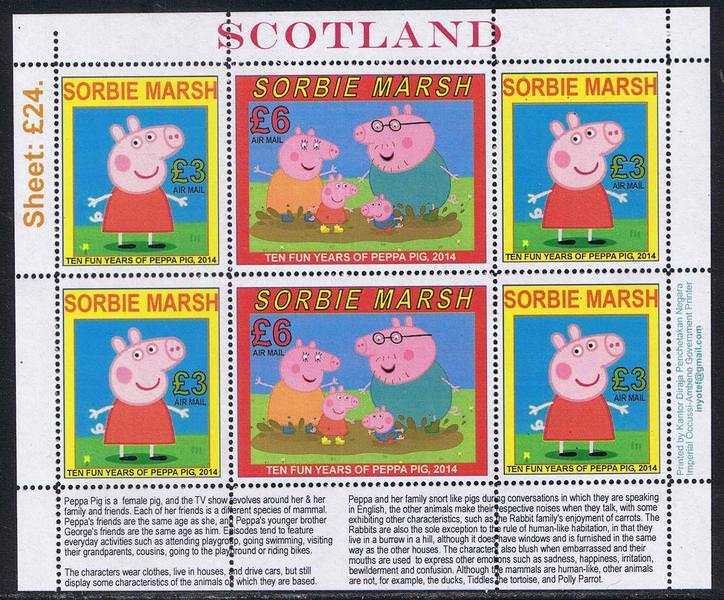 If you can kindly enclose a few recent mint sets of commemoratives or minisheets of your country (that I can sell locally so I won't be out of pocket to airmail the finished sheets back to you), that would be most appreciated.